Hubs and I have been mulling over reno costs, vacation costs and all those fun things and we've come to the conclusion that we probably spend too much moolah. And one of the prime things we spend too much moolah on is food. We actually have ridiculous grocery bills, considering there are just two of us. *In theory* we should be able to eat well on $400/month. And I suppose that, in theory, we could. But in reality, we end up spending a LOT more than that.....so that prompted a flurry of discussion and a decision (my doing) that this week, we would eat for free. As in, I would not visit the grocery store once this week. I'm starting off reasonably well, having just stocked up on a few things for hubby's wisdom tooth extraction (he's healing very well, by the way, and is most appreciative of your well wishes), so I'm improvising and making do with what I have. 1) Sunday I made up a crab pasta casserole of sorts.....basically, I took about a pound of macaroni and cooked it. At the same time, I mixed up some pre-packaged rosé sauce, and a can of half-fat cream of mushroom soup, and mixed it in with the macaroni, along with 1 box of frozen spinach, some onions, garlic and fresh basil, and 1 pound of imitation crab meat. Topped it with most of a can of spaghetti sauce, and then mozzarella and parmesan cheeses. This made an absolutely inordinate amount of food (8 servings) and used up a nice bit of stuff from my pantry. Two thumbs up from hubs, who was grateful for his first solid food in days. 2) Monday, I realized I would need to use up the tail end of my eggplant and tomato (from the stacks I made for the dinner party last week), so I decided to do two different indian dishes. I made up a 'butter eggplant' dish of sorts - about the equivalent of 1 large eggplant, 1 onion, 4 cloves of garlic, 2 T chopped ginger, 1 large chopped tomato, 2 T butter, 1 small can of salt-free tomato sauce, 1/4 c. vindaloo curry paste, and at the end, about 1/3 cup of low-fat sour cream. Very yummy. Paired it with a super easy chickpea curry - 1 onion, 4 cloves garlic, 1 T curry powder, 1 t mustard seeds, 1 t cumin seeds, 1 t ground cumin, 1/4 t cinnamon, then add a can of drained chickpeas and a cup of broth. Voila. Stirred some fresh coriander into both dishes and was good to go. Served over basmati rice. Easy-peasy and very satisfying. So that brings me to tonight, where I broke my lazy streak with the camera and actually took pictures. This time, the impetus was two mangoes that I HAD to have (they were on three for a dollar a couple of weeks ago - how can you resist this??? ), but that I had, thus far, been to lazy to prep. Peeling mangoes is a bit time-consuming, and since I normally bring fruit in my lunch, I just hadn't had time in the morning to get these guys ready to bring. I also had a huge bag of shrimp in the freezer (Costco....). So I thought...hmmm...mango and shrimp. I sense another curry coming on. A more thai-type curry. Luckily, I also had coconut milk, fish sauce, some freezer-burnt peas and some thai green curry paste. This would be great if you had fresh basil, but even with dried, it was pretty darn tasty. I used Jasmine rice for this. I have to say, I didn't get home until 6:30....I loafed around until almost seven, and I was actually done dinner and cleaning up dishes by 7:45. 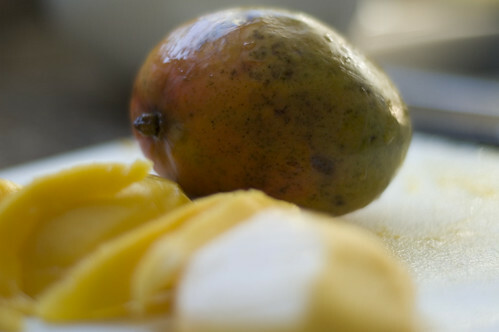 Aside from the mango, there is very little work in this recipe. You could add onion or garlic, or snow peas (would have added onion, but I only have one left.....). 2. Shell shrimp and peel and chop mango. 3. In a large skillet or pot, add the coconut milk, and stir in the curry paste. 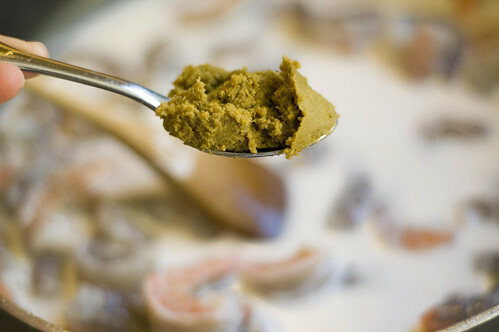 Thai curry paste is hot, so if you're not sure how much to use, err on the side of stinginess. I used all I had left. And yes, if you look carefully at the photo, you'll notice I forgot to add my curry paste at the beginning and am, in fact, adding it post shrimp. 4. 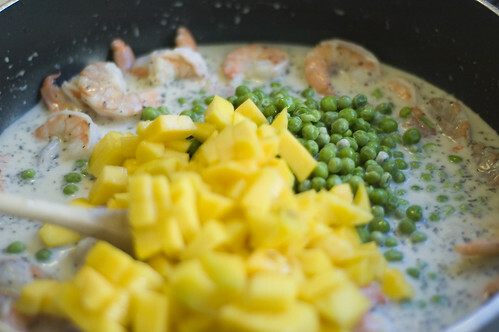 Add shrimp, mango, fish sauce, basil and peas and bring to a boil. 5. 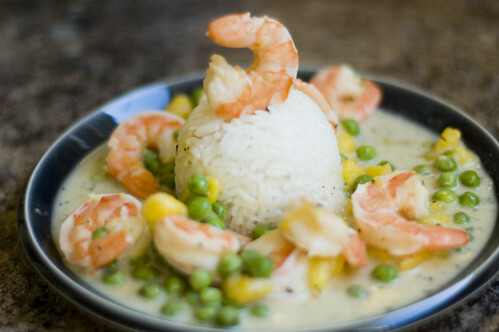 Cook until shrimp is opaque (about 5 minutes). Taste and decide if you want to add sugar (I like my curries sweet). 6. Serve over hot cooked rice. As mentioned, I like jasmine rice with thai food, but any rice is good. And if you can bring yourself to eat brown rice, power to ya. I just can't do it. So that was my ultra lazy (and free, hehe) dinner tonight. Now I'll have to figure out what I can come up with for tomorrow. I'm thinking some spicy black bean soup with garlic toast. Ya? Thoughts? It has to be easy and involve a minimum of fresh produce. I have a few carrots left (unless I give them to my resident furry friends), some limp celery and also some dill, parsley, coriander and frozen corn. Oh, and potatoes. I have those too). Thanks for reading! Hubs and I are debating having an 'eat for free' week every month or so to see if it works to help us cut back on grocs. Very cool idea Leslie! No way I could do it (2 kids and a hungry hubby), nor could I go $400 a month on groceries, but still a cool idea! Totally understand the insane grocery bills...for the two of us, we spend between $200 and $250 per week on food. But, that's the price you pay to not eat processed, prepackaged crapola...at least, it's the price you pay here! I do this often, mostly because I tend to start to collect so much and I don't want it all to go bad (or else I need some room in the freezer!) I'm constantly amazed on how much we spend for two of us, but it makes me feel better to know we are not alone!! I like this idea! Our freezer is full & never seems to get any lower so I think this would be a great thing for us to do every month as well. My husband loves stocking up on great deals with meat but it's getting a bit ridiculous in there!! I would love to be able to cut back on our grocery bills too. I think eating-for-free once a month is a great idea. Groceries can get extremely expensive. Our food don't often go to waste b/c my hubby hates throwing out food. But we do buy a lot of food, so once in awhile when we don't feel like cooking, we just basically ransack our fridge/cupboards and eat whatever we can find until we drag our lazy butts to the stores. We do this every once and awhile, not monthly though. However, we aren't quite as creative with our meals, as it is normally a freezer full of leftovers we need to make a dent in. Just wanted to tell you that I made this recipe when you first posted it, and we liked it so much we make it fairly often now - almost every week! Thanks Leslie!